Can you go to jail for what you post on your business Social Media account? I had the pleasure of attending the recent SWARM Conference in Sydney – focusing on the role of digital community managers and their potential to create value in their arena. Though overall it was an exciting and interactive conference where lots of extremely useful information was exchanged, there was one talk that absolutely terrified me. It discussed the one thing that all social media marketers fear – the legal implications of posting – and asked the question, ‘can you really go to jail for what you post on social media?’. Stephen von Muenster was the chosen speaker on this topic, and as an attorney at vonMuenster – a legal firm that specialises in the legal practice of media, marketing and advertising industries – he was certainly the right guy for the job. Stephen explained that social media managers (and inbound marketers alike) hold a significant level responsibility when it comes to managing risk. This is because not only are they often in control of the content produced by the business, but also because the content they control is instantly published online and a record of their uploads will remain in cyberspace until the end of time. BUT, there are ways that you can moderate your social media and reduce the legal risks linked to your account. The best way to do this is to understand the legal landscape you are working in and the implications of your social actions. There are two main sources of risk when it comes to social media: you and your actions. When you take on the role as a company’s marketing or social media manager, you are inheriting the responsibility of that company’s posts. It is important that you take control of ALL content that is set to be released to the web. Make sure you QC work done by others as much as you can so, ideally, nothing is uploaded without your approval. If you are accountable for the social media, you should expect to be accountable when it goes wrong. Making claims that are incorrect and making promises that you can’t keep is bad for business and publishing those claims is bad for branding, so don’t do it. Remember, you are responsible for comments too! The majority of your time will be focused on the content you are churning out online, but it is vital that you keep an eye on the conversation happening below the post. As the owner of the social media account, you are legally responsible for the comments that fans and followers make on your posts. This means that everyday you should be vetting your social comments and removing replies that may cause harm or offence to anyone operating in the social media realm. Additionally, if users post copyright protected material onto your business page (e.g. your Facebook wall), you are liable for copyright infringement as you are a business that should be moderating this type of content. Top Tip: Establish ‘house rules’ for your social media commentary and post them on your social media pages so if you do have to block a user that has breached those rules you have the reasons published in black and white on the very page the offence occurred. Rules are rules guys! Breach of Copyright Law is one of the most common stuff-ups for marketers. This is because there is a laissez-faire approach to sharing online. Images and quotes are chucked around the twittersphere like there is no tomorrow and barely even Google can locate the origin of an image these days – particularly when there are now hybrid and remixed creations such as memes and mash-ups to confuse the system. Honestly, Copyright Law within Australia has some serious catching up to do when it comes to social media. The current legislation just doesn’t seem to account for the ‘sharing culture’ occurring online. However, until the law reforms and there are new rules put in place, marketers have to stick to the restrictions set. This means that currently if you post any copyright-protected material to any of your social media platforms, you could be liable for copyright infringement. Top Tip: Stephen suggests that if a brand wants to use trending content, then it needs to make sure that it remains within the architecture of the platform it was originally sourced from. For example, if you saw a post on Facebook that you wanted to share on your business account, just share it on Facebook – don’t copy and paste the content into a tweet or a LinkedIn post. Spam - no thank you Ma'am! The Spam Act 2003 prohibits the sending of unsolicited commercial electronic messages (aka any offers, promotions, advertising material) to any poor forsaken soul via email, text message or instant messaging platform (including Facebook, Instagram and Twitter private messages). Luckily the ever-so-handy spam folder in most people’s mailbox removes a lot of this junk, but even if it doesn’t make it to the receiver’s screen, the sender could still be in trouble. Consent: You must only send message with the addressee’s consent. Hint: This means that inbound marketers are off the hook because if all emails and messages are sent to members of their HubSpot contact list, consent has already been granted by the contact when they filled out an inbound form. Identify: Include clear and accurate information about the business sending out the message. Tell them who you are, what you are about and why you are talking to them. It is always best practice to be upfront and honest when chatting to your leads. Unsubscribe: There needs to be an option to unsubscribe in all of your messaging so that addressees can opt out if they want. ACMA also suggests that you deal with unsubscribe requests promptly. This can often be assisted by an automated unsubscribe form (much like the ones featured in HubSpot’s email marketing tool), so that requests are instantly actioned. Are you guilty of committing any of these social media crimes? 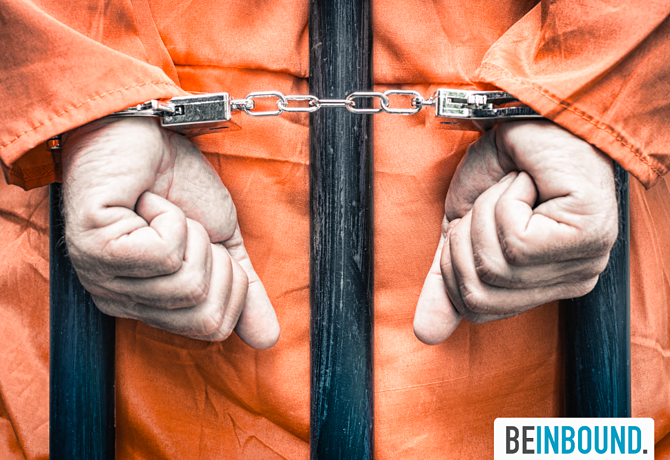 Well luckily, the team at BeInbound won’t report you, but to make sure you keep on the straight and narrow and avoid some heavy jail time, you might want to have a read of our latest free eBook. It will give you some top tips on how to transform your marketing so it can (legally) survive in the digital world. It is free so we won’t charge you with theft… We promise….